This page contains a retro-chronological overview of projects and activities organized by Sarma since its launch in November 2002. These include various discursive events and performances, workshops and labs, research projects and publications. In most cases, it also assembles documentation, materials and resources for critical reflection. The wide variety of formats reflects Sarma’s ongoing concern to experiment with the ways in which discursive practices are shaped and situated. Attention for communal and collaborative contexts like labs and salons moreover sought to open up the understanding of dramaturgy and research in the performing arts. I Paused Halfway Up The Stairs, a curatorial project by Tom Engels, brought together artists and cultural workers that have been involved in the recent migration of choreography and performance from the theatre to the visual arts context. Over the course of two evenings, I Paused Halfway Up The Stairs raised questions about how performance practices play with this institutional border, and how they appropriate, negotiate and challenge its aesthetics and production circumstances. The works and talks presented, laid out a landscape of different takes on the relationship between performance, choreography and the visual arts, and tried to redefine, question and challenge these notions, its methods and institutions. I Paused Halfway Up The Stairs contained works and words by Simon Asencio, Alexander Baczynski-Jenkins, Lina Hermsdorf, Clare Molloy, Thomas Puisquelaloi and Marta Ziólek. Open lab intitiated by Kristien Van den Brande. How do supports of writing - a book or a single piece of paper, pencils, typewriters or internet pages - work on our thoughts? 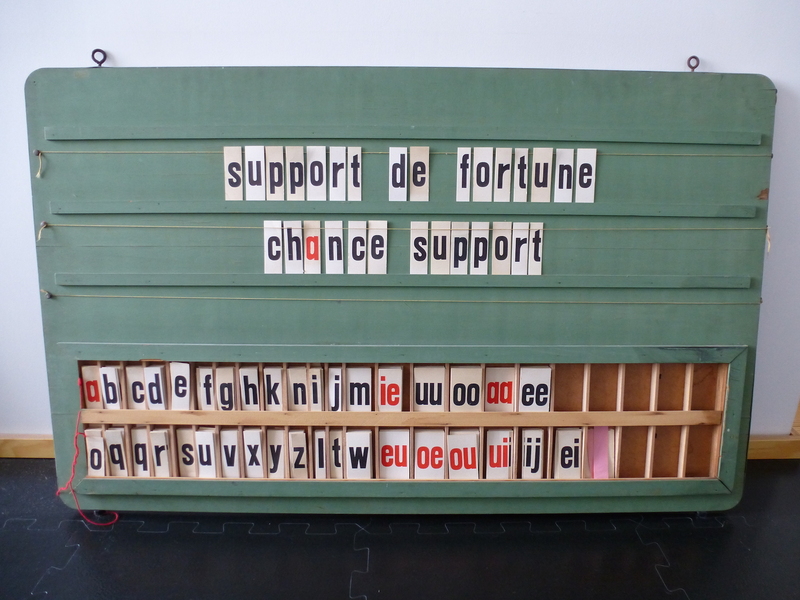 How do ‘chance supports’ (a train ticket, the back of an envelope, the margin of a book) challenge common ideas and practices of archiving, binding, displaying, reproducing, translation? With artist talks and performative readings by Jonathan Lahey Dronsfield, Femke Snelting and Nick Thurston. In his book Through the Back: Situating Vision between Moving Bodies (published in May 2014 by Theatre Academy in Helsinki), Jeroen Peeters reflects on spectatorship in contemporary dance. Sarma coproduced the book, set up several presentations and documented them with audio -- with interventions by Gerald Siegmund, Chrysa Parkinson, Philipp Gehmacher, Jennifer Lacey, André Eiermann, Mette Edvardsen, Stefanie Wenner and Martin Nachbar. Performance artist Myriam Van Imschoot organized a one week lab at BUDA in Kortrijk on the way humans can imitate their natural surroundings with their voice. A lab with sound artist Fabrice Moinet and composer Cathy Van Eck curated by Myriam Van Imschoot at Pianofabriek in Brussels, which included a public evening with a performance and artist talks. Through zooming into the technical interfaces mediating vocal performance, the lab explored how various spatial, sonic and conceptual configurations allow us to experiment with different registers of performance and listening. Can ‘enchanting scores’ create the conditions for alternative forms of relationality and agency to emerge? Exploring the critical potential of trance practices in today’s art and society was at the heart of Enchanting Scores, a workshop and salon curated by choreographer and visual artist Julien Bruneau, with interventions by anthropologist Arnaud Halloy and philosopher Isabelle Stengers. How do artists work today? How do they speak about their method? These questions were at the heart of a series of ten salons that took place in Brussels from 2011 through to 2013. Artists and theoreticians were invited to reflect on new practices and languages of making in the field of dance and beyond. Several salons are documented with audio recordings. Guests included: Jonathan Burrows, Noé Soulier, Bojana Bauer, Jeroen Peeters, Shila Anaraki, Ellen Bilterest, Sara Manente, Leslie Mannès, An Mertens, Lilia Mestre, Stefan Prins, Kajsa Sandström, Manon Santkin, Marcos Simoes, Alma Söderberg, Rodrigo Sobarzo, Anna Rispoli, Michiel Vandevelde, Arnaud Halloy, Julien Bruneau and Isabelle Stengers. 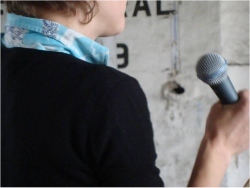 A lab curated by Myriam Van Imschoot at Pianofabriek in Brussels, it included a workshop on ‘handmade radio’ with Anne-Laure Pigache and Alessandro Bosetti – who also presented vocal performances in a public ‘Soirée Parole’ – and a lab on ‘silly singing’. A third part consisted of a Yodel Intensive at Campo in Ghent, with Doreen Kutzke, the yodel queen from Berlin. Film maker Pablo Castilla, with whom Myriam often collaborates, was present to integrate the medium of video. The workshop concluded with a simple group piece. A workshop by Sarah Vanhee based on the performance practice of her piece * Turning Turning (a choreography of thoughts)*, in which performers attempt to grasp different layers of the ‘here and now’ in real time in spoken language. Documented with expert videos and an essay by Joe Kelleher. A dramaturgy workshop with Jennifer Lacey, which was followed by a lab with a smaller group, Dilettantsm unbounded, in which these principles were applied to the creation process of Die Unbändigen by the collective of Jack Hauser, Satu Herrala, Sabina Holzer and Jeroen Peeters. They documented the whole process with text, images and video. A lab on scores, experimental writing and collective discursive practices curated by Jeroen Peeters. With Shila Anaraki, Julien Bruneau, Mette Edvardsen, Jack Hauser, Leslie Mannès, Manon Santkin, Sarah Vanhee, Myriam Van Imschoot. The documentation includes a dictionary of invented words created by the group. An explorative workshop hosted at WorkSpaceBrussels by photographer David Bergé and choreographer DD Dorvillier in search of the individual qualities of photography, the photographic, movement and choreography. A workshop in physical dramaturgy by choreographer Martin Nachbar and dramaturg Jeroen Peeters at WorkSpaceBrussels, with a focus on a collaborative setting and the role of bodies, objects and physical practice in the production of meaning. A small lab on artistic documentation with Philipp Gehmacher and Alexander Schellow, it constituted one of the elements of their walk+talk project at the Kaaistudio’s in Brussels. Animated lecture by David Zerbib, invited within the context of VoiceLab. 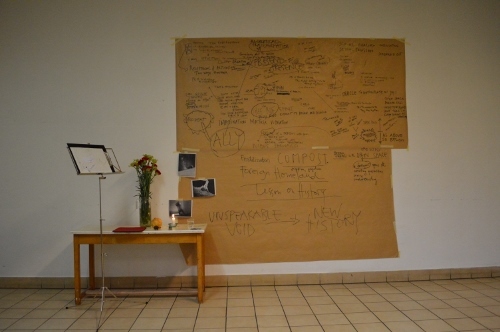 Curated by Myriam Van Imschoot and Alex Roccoli, this was the first ‘open dramaturgy’ lab Sarma organized in collaboration with WorkSpaceBrussels. Voicelab gathered makers from different disciplines (dance, music, sound mastering, writing, theater) to explore the intertwining possibilities of performance and voice/sound. At the launch of his anthology of critical writings on Sarma, Rudi Laermans gave a performance lecture on the role of sound in contemporary dance, accompanied live by guitarist Burkhardt Stangl. At the launch of his anthology of critical writings on Sarma, Pieter T’Jonck created a lecture demonstration with four performers experimenting with different forms of entering and leaving the stage. On the invitation of Sarma, essayist and dramaturge Marianne Van Kerkhoven presented a lecture at the KunstenFestivaldesArts. The text available in Dutch, English and French. Fifty years after the world exhibition in Brussels, Sarma created an anthology with writings by Marcel Lobet and Georges Sion. 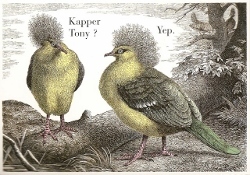 Eric De Kuyper created a video lecture on this occasion. B-Chronicles is a socio-critical and artistic project conducted by Sarma dealing with the impact of the increasing mobilities and international production facilities on the working and living conditions of dance makers and communities. It encompasses a sociological research based on interviews with various participants in the Brussels dance community, a series of international publications in Etcetera, Janus and Sarma, the creation of a community game, lectures, performance and video works. B-Chronicles was presented at the Volksbühne in Berlin in December 2006 with the creation of a Community Picture by David Bergé and Myriam Van Imschoot, and lectures by Dieter Lesage, Jorge Leon, Meg Stuart and Marten Spangberg. A second presentation followed in January 2007 at the Kaaistudio’s in Brussels, with the presentation of Jorge Leon’s video work Between Two Chairs, the lecture * Becoming Room, Becoming Mac by Eleanor Bauer, and the Community Game* by Delphine Hesters and Dimitry Masyn. B-Chronicles is documented extensively on a project website. In the framework of the German Dance Congress in Berlin, Sarma organized a second colloquium on the critical, with lectures by Irit Rogoff and Dorothea von Hantelmann, as well as a series of conversation with the critics Constanze Klementz, Eva-Elisabeth Fischer and Gabriele Wittmann, choreographer Martin Nachbar and curator Johannes Odenthal. An afternoon at deSingel in Antwerp around the work of the ‘artist twin’ deufert+plischke. It included a lecture demonstration and a scored dialogue in a poster installation created for the occasion. Expanding its Oral History Bank, Sarma documented a series of lectures and conversations at the Springdance Festival in Utrecht. Guests included André Lepecki, Hooman Sharifi and Boris Charmatz. An afternoon at deSingel in Antwerp around the piece 'Forgeries, love and other matters by Benoît Lachambre, Meg Stuart and Hahn Rowe, with a focus on collaboration, dramaturgy and the creation process. Next to the artists, Michael Floyd, Jorge Leon, Jeroen Peeters and Myriam Van Imschoot took part in it. Documented as part of Sarma’s Oral History Bank. A symposium organized by Aisthesis, pairing performing artists and dramaturges in a series of conversations. Documented as part of Sarma’s Oral History Bank. A year after the Klapstuk #11 in Leuven, choreographer Jérôme Bel and several guests looked back upon the festival. Sarma assembled various polemics around the status of ‘contemporary dance’ and ‘conceptual dance’ in Flanders, the Netherlands and France, and documented the debate as part of its Oral History Bank. Sarma invited Bojana Cvejić as writer in residence during the Amperdans festival of wpZimmer and Monty in Antwerp. A colloquium organized by Aisthesis at the Amperdans Festival in Antwerp, with lectures by Rudi Laermans, Pieter T’Jonck and Ramsey Burt, documented by Sarma as part of its Oral History Bank. In the framework of a three-week event curated by Barbara Raes and Myriam Van Imschoot at Vooruit in Ghent, Sarma edited anthologies around the work of Vera Mantero and André Lepecki. Jeroen Peeters was invited as writer in residence during the entire project and published extended notes and interviews on Sarma. Launch of the anthology Eric de Kuyper at the Kaaistudio’s in Brussels during the KunstenFestivalDesArts. The editors Myriam Van Imschoot and Jeroen Peeters interviewed the author. Sarma organized a colloquium on the critical at the Amperdans Festival of wpZimmer and Monty in Antwerp, with lectures by philosopher Thierry De Duve, dramaturg Erwin Jans and dance critic Pieter T’Jonck, as well as dialogues with critics, presenters and artists reflecting on the critical component of their practice: Natasha Hassiotis en Alexander Baervoets, Tang Fu Kuen en Arco Renz, Hooman Sharifi en Marit Strømmen, Helmut Ploebst en Barbara Van Lindt. Launch of the Anthology Unfolding the Critical. Sarma’s website was launched in November 2002 during the event B-Visible, a 72 hour ‘queerathon’ curated by Kattrin Deufert, Jeroen Peeters and Thomas Plischke at Vooruit in Ghent. Sarma documented various lectures and discussions and invited researcher Martin Hargreaves as writer in residence.